Just like Arcane, Perge reveals little by little the bottoms of his history by dispersing since Green Dessert some recordings ignored in his vaults since the beginning of the 70's. The link with Arcane? At the beginning of his story, Paul Lawler wrote Max Richter's history which became the pivot of the myths and the legends of Arcane; a band which knew a tragic ending and which was resuscitated by this skillful storyteller and composer whom became Paul Lawler. After the release of Green Dessert in 2014, we suspected that Perge was not any more only a duet which was inspired by the live music that Tangerine Dream signed between 1980 and 1983. And “Aural Coefficients Within a Fractal Plane” confirms these doubts, while that Matthew Stringer and Graham Getty give to their fans a first volume of concert recordings that Perge has performed in the decade of 1970 to 1980. So Perge shared the spotlights of an EM floating and experimental, the genesis of Berlin School, with outstanding concerts which wasn't any more the unique privilege of his brother of sound; Tangerine Dream. Myth or reality! Is it really important? Because the illusion is simply perfect between the famous bootleg Coefficient of Aural Expansion, which is an audio recording of a splendid quality (I think it's from the BBC source) of a concert of Tangerine Dream at the famous Royal Albert Hall (London) in April 1975, and "Rubidion" which opens this last box of surprises from Perge. The intro is more hazy here. I would say richer in tones and in synth lines which float between two spheres with an approach as much nebulous as that of Tangerine Dream during this concert broadcast on the BBC waves. Fruity layers in tones of an organ not too much some of its identities and discreet layers of voice contaminated by industrial essences perfume these very enveloping ambiences which float for these first 8 minutes. It's at this moment that an embryo of rhythm develops with a line of sequences which makes rise up and fall down its series of 5 keys. A series which rolls in loops, confusing the ear with an imperfect key and a subtle change of tone, beneath soft synth solos which go adrift and which spin out in tones of former days. If our feet don't move, our neurons follow wonderfully this structure of rhythm of which the gradual swiftness is concealed by a plethora of synth solos to tones as sharp as a nightingale in heat or yet as so nuanced as a Mellotron and its mystic chants of mist. Mellotron which becomes more dominant around the 13th minute with layers which drift like these clouds pushed by speeded-up images while the rhythm loses little by little the swiftness of its keys which rage with the arrival of the wooden tap-dancing. And "Rubidion" to get lost, for its last 4 minutes, in psychedelic ambiences where synth waves, chirping, faded voices and hubbubs of machines are amazed in front of a splendid fluty chant. "Anfa Part One" walks on the sonic ashes of "Rubidion" in order to begin with a very ambiospherical approach where the sounds and tones are masters of a bottomless gap. Nasal tones and titanic shadows arise from these depths to weave a Mephistophelian mood that a structure of rhythm tries to catch and of which the obstinacy of the keys end by eventually dominated the ambiences. The rhythm which follows adopts a kind of gyratory structure where all its elements swirl in a small circular cylinder. The synth pads decorate this motionless rhythm with beautiful whistled tunes while a crack in the tube lets escape some rebel keys which dance in parallel before being sucked up again under a hold of the mist and of its chants adorned of a little silvered armor. "Anfa Part One" flows towards "Anfa Part Two" in the tranquility of its jungle noises imagined by neurons overheated to white. It's a moment of quietude in a very murky mood where arise ambient tunes from a misty Mellotron. Heavy layers crush down these ambiences and draw an apocalyptic envelope while "Anfa Part Two" goes down and sinks more and more into the kingdom of our imagination. We can paint the slow flights of birds here which tickle the surface of black oceans with their wings on fire. We can paint lavas of an underground volcano which little by little emerge from waters to feed banks of larvas whose each breath shines with a different color. In brief, a feast for the imagination with a pallet of tones as blazing as our state of mind. A pulsating line gets out of this heap of nasal lines in order to beat in a hopping pattern with the ferocity of its rebel keys. Multicolored pads try to smother this cavorting rhythm that some metallic jingles help to inhale under this dense shroud of mist. And only a chthonian choir, we can add also some sound explosions, annul this pulsatory rhythm while that "Anfa Part Two" embraces its very last minutes. A long droning wave covers the introduction of "Bataclan", and these noises of crowd which do so much those of Paris 82, which presents straight out a structure of linear rhythm where a thick cloud of keys skip as taken in the fury of a vertical storm. The keys skip fervently, wearing our neurons, under tears of synth which sweep the horizons, such as these lighthouses which used to guide boats but with sound glints closer the apocalypse. A shadow of bass muffles the vitriolic violence of the rhythm a little after the point of 6 minutes. Its sonorous mass radiates over the synth layers which take back their ascendancies on this furious rhythm weaved in a meshing of stormy sequences and of sober electronic jingles of the percussions. In reality, "Bataclan" is more than 14 minutes of pure electronic rhythm with variations and nuances in the deployment of the sequences which give the impression that the rhythm evolves while it's constantly in a linear but very lively state for fingers and neurons. It's lively, sometimes violent, and the synths try with great difficulty to contain this bubbling rhythm with multicolored fineries and psychotronic effects while they are only ennobling the beauty and the power of a brilliant work of sequences. Fiery, impressive and our neurons are short of breath. Surprising and powerful, “Aural Coefficients Within a Fractal Plane” is a real journey in time. The stories and the legends become blurred in front of a recording of such quality. 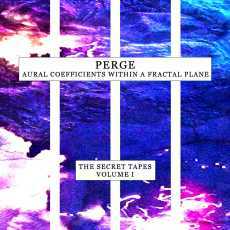 For the historians and the makers of legends, “Aural Coefficients Within a Fractal Plane” confirms well and truly the presence of Perge near the 70's. A myth? A reality? We don't care, as much as the music is good and glitters actually of the perfumes of these years. Except that Perge has without a doubt understood that it was better to build good pieces of music of 30 minutes than to put the same 30 minutes in an ocean of 60 minutes which led us to forget these 30 minutes! I'm already looking forward to hear the Volume II.